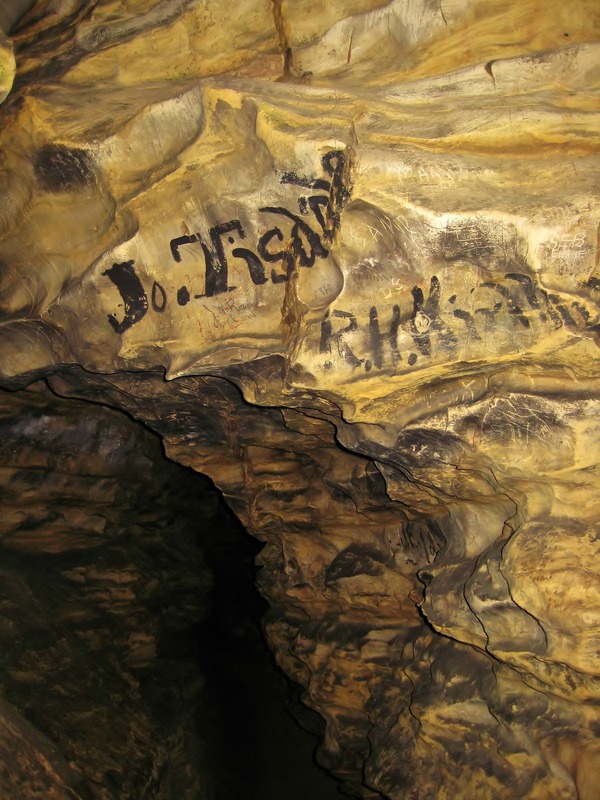 Mark Twain Cave in Hannibal, Missouri, USA. During my visit to St. Louis, MO, I had the opportunity to visit Hannibal, a little town where a young boy with the name Samuel Longhorne Clemens spent his boyhood in the middle of the 19th century. He later became famous by his pen name Mark Twain. 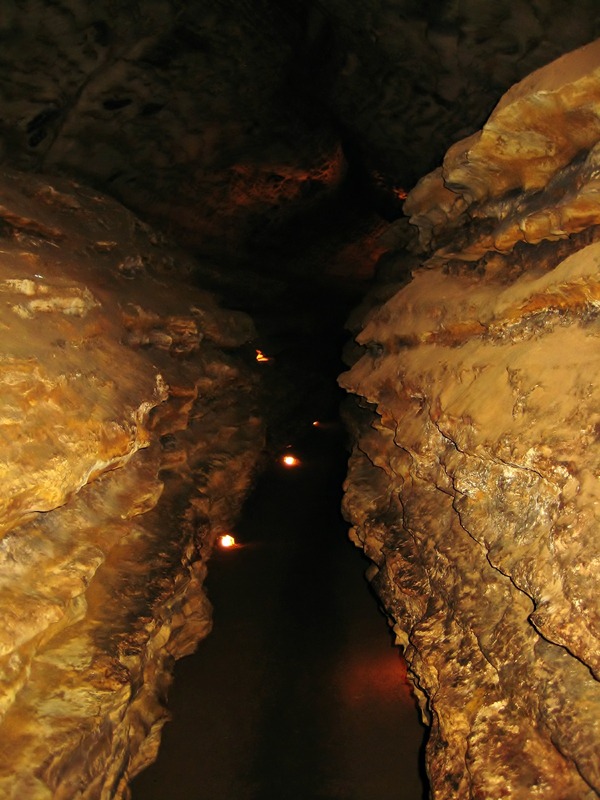 The Mark Twain Cave Complex is situated near Hannibal, MO, and consists of two show caves, the Mark Twain Cave and Cameron Cave. 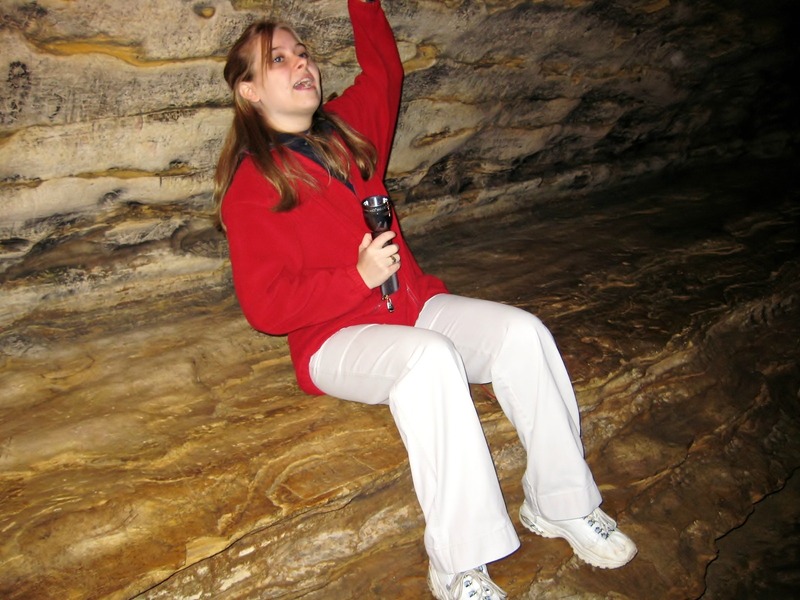 We (me and my friends) did a guided one-hour tour through Mark Twain Cave, which is Missouri’s oldest show cave. 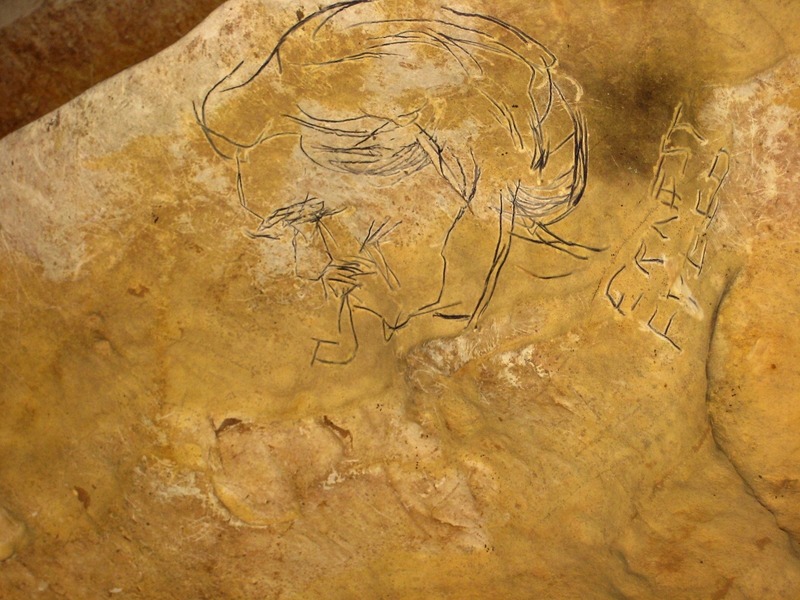 It was discovered in the winter of 1819/20 and first shown in 1886. 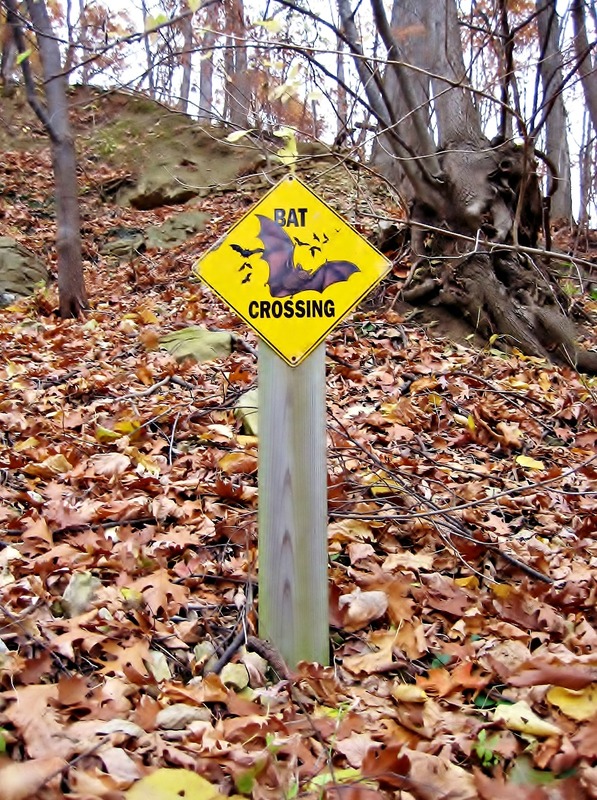 It is a Registered National Natural Landmark since 1972. Mark Twain Cave covers some six and a half miles (about ten kilometres), and consists of four entrances and 260 narrow, winding passages. We were surprised when it turned out that a young girl would be our tour guide, but she actually was entertaining, competent, and – most importantly – direction savvy. And we were the only visitors on that day, so we got a private tour. It was November, but the cave has a constant temperature of 52 degrees Fahrenheit (11 degrees Celsius) anyway, and you should bring a sweater or jacket when visiting. The cave walls’ textures are absolutely amazing. 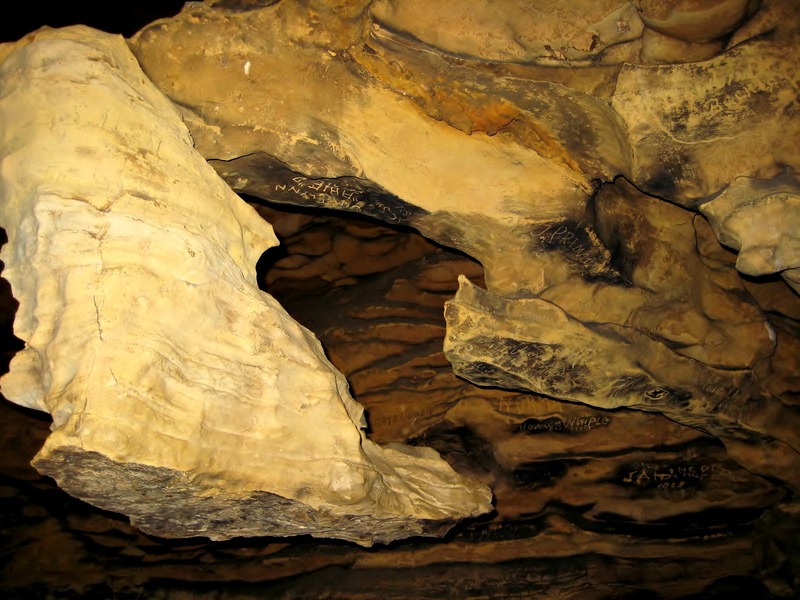 It is made of a soft limestone called Louisiana Lithographic Limestone, which is found only around Hannibal and – obviously – Louisiana, Missouri. 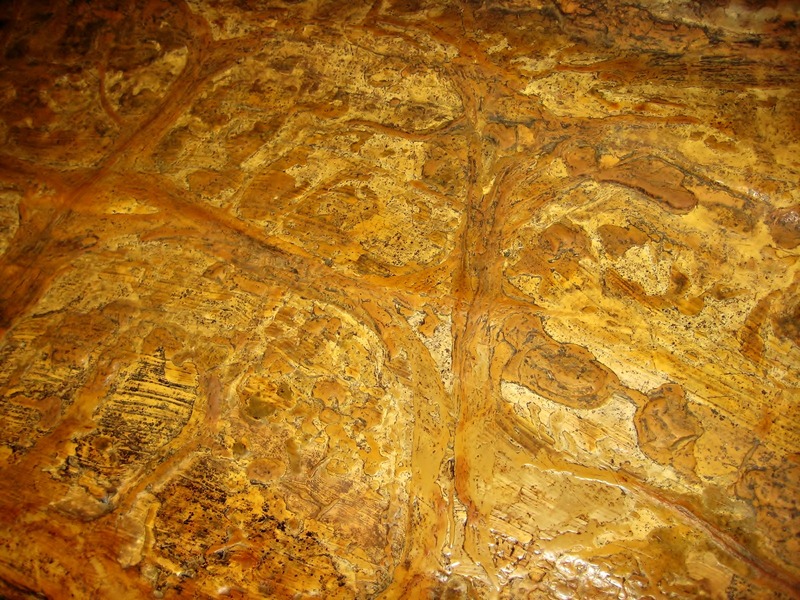 The stone is around 350 million years old, the cave passages were formed 100 million years ago. 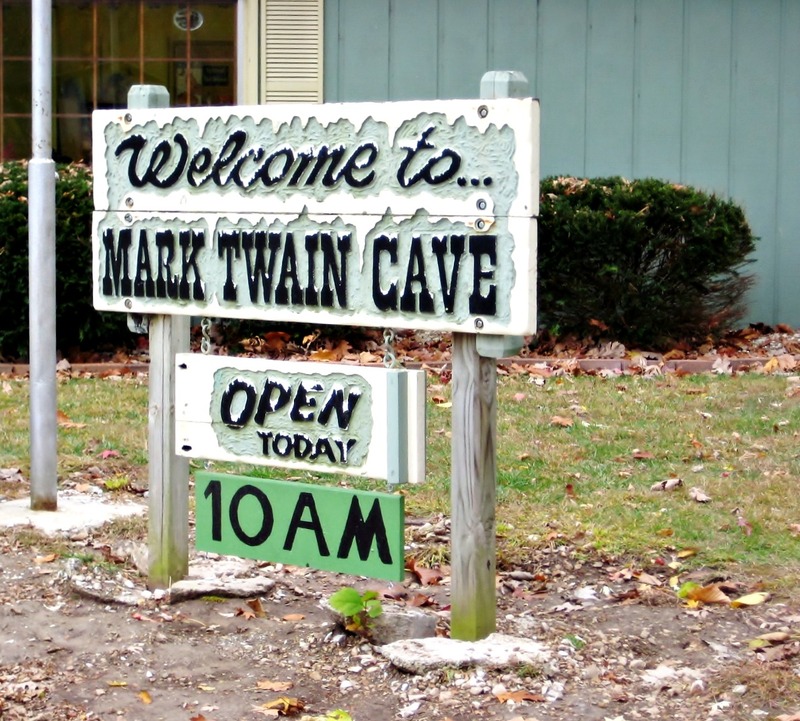 The Mark Twain Cave Complex is named in honor of the author, and this makes sense. 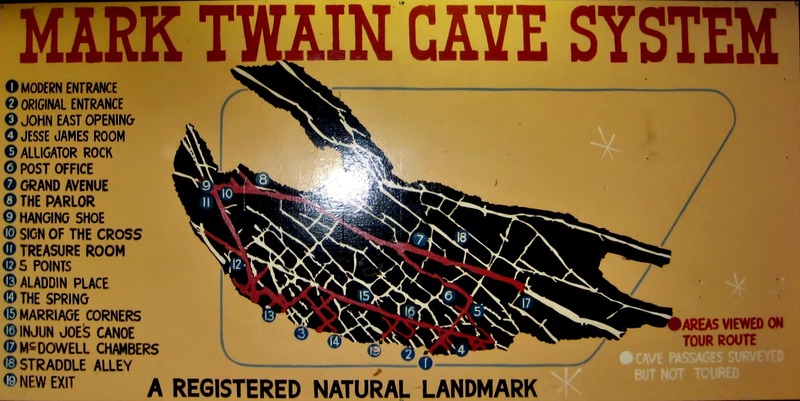 Though Twain was born in Florida, Missouri, he spent his entire boyhood in Hannibal, and the cave system was a popular playground for kids at the time (in the midst of the 19th century, no parent would allow this anymore nowadays, and it’s forbidden anyway). 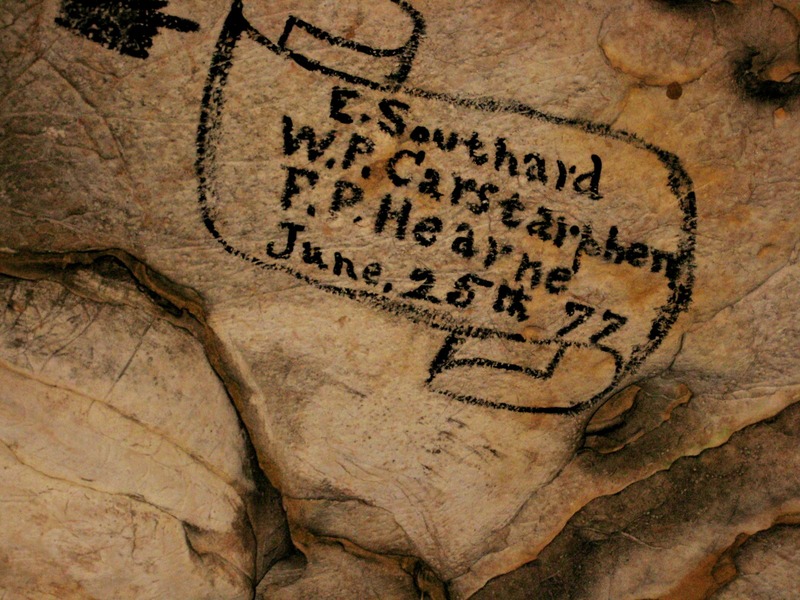 Mark Twain used to play here too, and the cave was written about in five of his books, including The Adventures of Tom Sawyer and the Adventures of Huckleberry Finn. 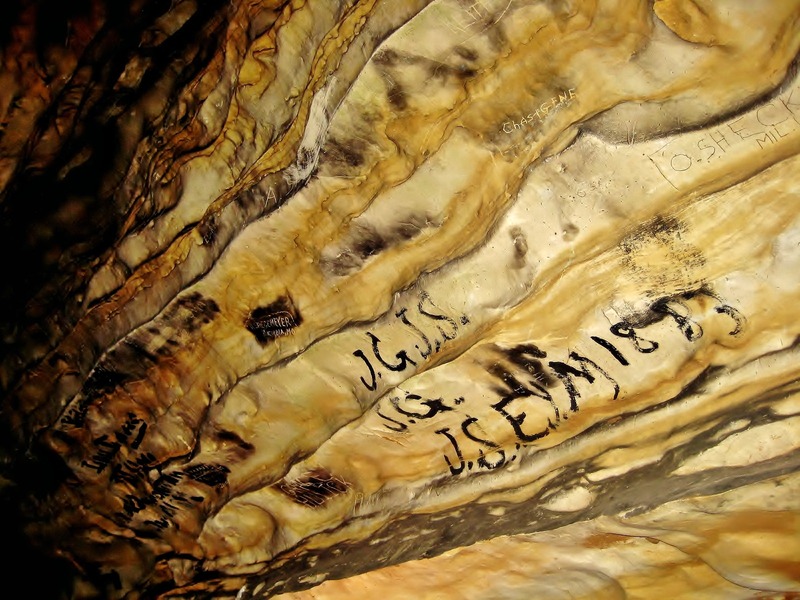 People have been visiting this cave for almost 150 years, and many left their autographs or drawings on the wall. This is not allowed any more, what a pity, it was an early form of street art. The cave is lit with electric lights all over the place, but at some point our tour guide switched the lights off. And it was pitch pitch black. You only can imagine how people must have felt when they got lost here and their porch went off. 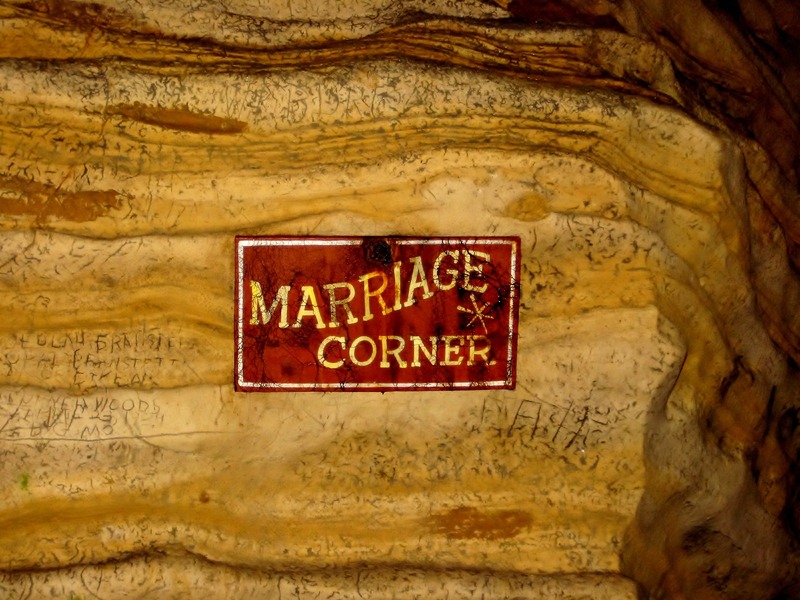 And just in case you’re looking for an original place to marry, here’s your chance: The cave owners offer the location for your exchange of vows. Wow, that’s a big cave. Great photos. Great photos . . . some of those could be stand alone art pieces! Thank you Tim, hope to see more of your travel photography soon! Entertaining post about caves. Who would have known about them? It is a bit interesting that you found this place. Nice colors and patterns of the caves. 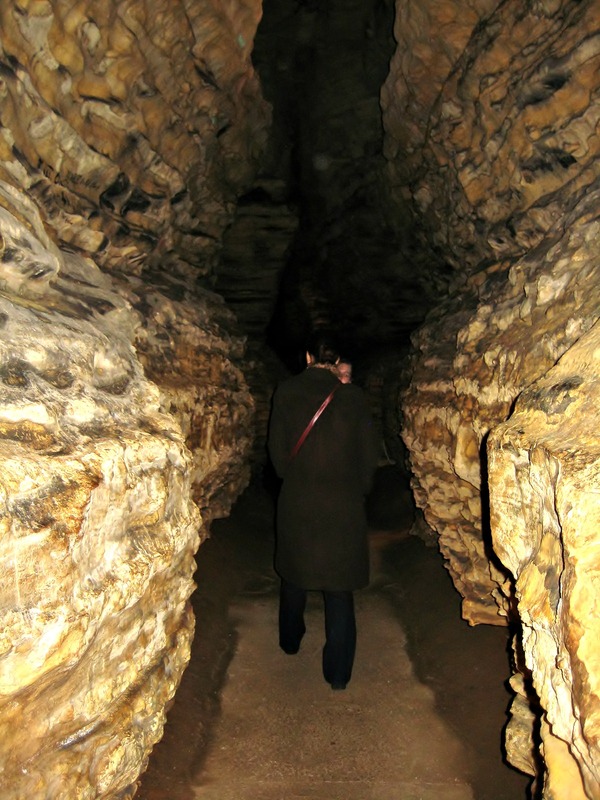 They are close to Hannibal where a lot of people go to visit the Mark Twain museum, and the caves have become a must-see sight. They’re really gorgeous! A classic “Roadside America” attraction. Looks like you enjoyed yourself. Thank you so much for your kind words and your Twitter RTs 🙂 The cave was amazing, even more so when you realize that Mark Twain played here as a young boy.